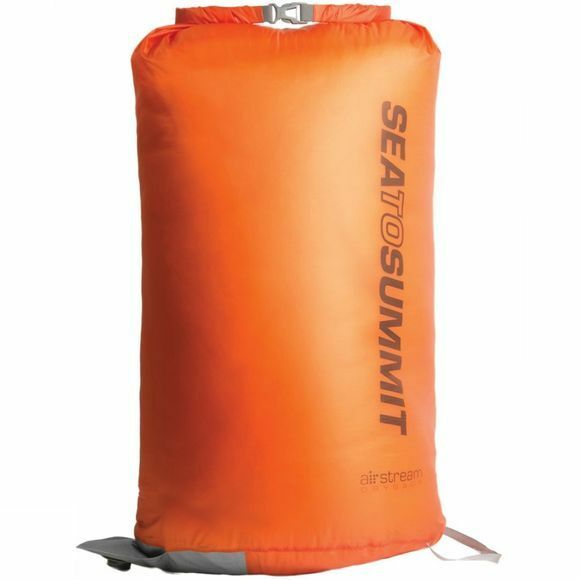 The Air Stream Dry Sack from Sea To Summit also doubles as a big-volume sleeping mattress pump, it is based on their 35L Ultra-Sil Nano dry sack, with an added valve plug and foot loop. Using the venturi effect means the 35 litre Air Stream can be inflated with little more than a single breath. Two to three cycles from the Air Stream are enough to fill Sea to Summit Sleeping mats, meaning your bed is ready sooner for that well earned rest. It will leave minimal breath condensation in your mat and reduce the chance of your own dizziness from blowing the mat up. The Air Stream can also be used as a 35L dry sack, or ultralight pack liner.